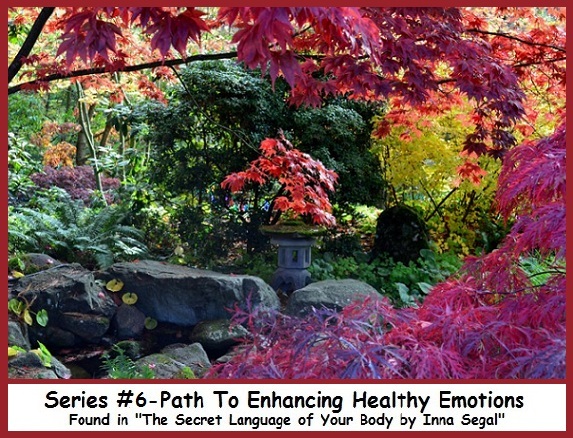 As we continue author Inna Segal’s Exercises Enhancing Healthy Emotions, lets first look at her next to last principle for healing. Principle 9: Make Gratitude Your Attitude. Focus on all the great things you have in your life instead of thinking about what you don’t have, complaining about your lack and limitation. Remember, what you focus on grows; if you choose to place all your attention on what you are unhappy about, it will multiply. Now begin the exercises by finding a quiet comfortable location and body position. Breathe deeply for several moments. Keep a notepad and pen nearby to write down insights that may come to you in the process. Now begin the exercises by finding a quiet comfortable location and body position. Breathe deeply for several moments. Keep a notepad and pen nearby to write down insights that may come to you in the process. 3. Focus on receiving. This means that if someone gives you a compliment, a gift, a raise, or praise, take a moment to really receive this and acknowledge yourself. Every day, begin to recognize that which is good, positive, and beautiful in your life. Do this by writing it in a journal and affirming it to yourself every morning before you get out of bed. Learn to recognize great things as they occur in your life. 3. Become aware of how your body feels. Focus on breathing slowly and deeply, allowing every part of you that is holding stress to soften, relax, and let go. Give yourself permission to take time out, to relax and to rest. 3. Look at your life and become aware of where you honor, validate, and make empowering choices, and where you do not honor and respect yourself. When you are aware of the areas you need to work on, you can begin healing, changing, and transforming. Use this Respect Process often to help you release shame and welcome respect. SERIES #7 COMING UP NEXT. CONTINUE PRACTICING EXERCISES INDIVIDUALLY OR TOGETHER IN ANY ORDER.